We are experienced Florida Short Sale Agents– but don’t take our word for it- see and read what some of our clients have to say about us getting their short sales approved. Not all of our sellers can give us testimonials because they are in businesses where they could lose their job or security clearances and other confidential matters whereby it is not a good idea for them to say they did a short sale. But many of our sellers do give us written testimonials. When you are looking for a short sale agent don’t depend on designations, depend on results. Don’t ask how is the agent’s closing ratio because if the agent has closed one short sale for a seller but only has that one listing they are truthful when they say they have a 100% success rate. I cant thank you, Nestor, Katerina and Cheska enough for all the excellent work you did for me on this seemingly never ending adventure called my Short Sale! From the first time I talked to Katerina at Vanice Zimmer advice,(Thank you Vanice), I felt comfortable and confident to trust your Real Estate team with my future. Cheska has always been gracious and flexible with showing the apartment and you and Nestor have been miracle workers with the banks. I am so grateful to all of you and would recommend you highly! We wanted to take a few minutes to say goodbye! We sold our home today to a very excited first-time homeowner. The reason we want to say farewell is because we tried to be involved with this community and got to know many of you as homeowners and friends. We bought at the peak and saw the prices drop almost 50%, it was a bad investment for us, just bad timing. We truly wanted to make of Carriage Pointe our home for many years to come…, however we had no idea what we were getting into (first time home owners) and although this homes are great and we enjoyed enormously our house we did not expect to have such high rates of tenants, then the maintenance and investment in the community were compromised due to today’s economy and just did not add-up for us, so we have found a buyer for our home, of course we were “under-water”, fortunately the bank forgave us for the difference and we are free. If any of you need advice, I recommend to do research and then some more research, because every single situation is different and particular. I truly wish all of you the best. For some the best is to find some kind of arrangement with their banks, for some will be walking-out, short selling or in some cases even foreclosing. The market will pick-up, eventually, lucky those who have the time, money and patience to wait. I also wanted to recommend my realtor, she specializes in short sales, is very professional and knows her business. She understands the process, the way different banks work with short sales, showcased my home very well, negotiated with my bank for them to forgive us for the difference and I understand will be doing some seminars on short sales soon. Please know that I am not recommending a short sale for your property and some loans don’t qualify for this type of sale anyway. You can visit them at: http://www.wellington-luxury-homes.com; in their website you will find their contact information as well as some articles about short sales. If any of you ever need to contact me or Richard, please feel free to e-mail or call @ (561) 503-0492. God bless you all! Our experience with International Properties and Investments, Inc was superb! Katerina, Nestor, and Milet are very professional, knowledgeable and helpful, and having them represent our property was a pleasant undertaking during a stressful time. We needed to “Short Sale” our property and they helped us through the entire process. They found the buyer and dealt with the bank in a timely matter. We would highly recommend them. Thank you for the fabulous news! This is so wonderful. You guys were so awesome. I’m going to work on my glowing recommendation. I can’t thank you enough. International Properties and Investments, Inc. It has been such a wonderful, professional experience working with you and your tenant I was amazed at how quickly you were able to have this Short Sale approved. You were able to have this done within the time requirements of the contract and I have never seen that happen on a Short Sale before. My past experiences with Short Sales bad been dire and when I wrote this contract I worried that it would be a long acceptance time and another unhappy outcome. How fortunate for me that you are a team of professionals. The acceptance and turn around time that you were able to achieve from Lender amazed me. My bat is off to you for successtbily navigating and negotiating this Short Sale. I will feel most fortunate if I have more opportunities to bring buyers to your Short Sale Listings. I will be able to say to my buyers with confidence that I know about your experience and attention to detail to make a Short Sale happen. Additionally, I want to mention that I enjoyed working with your assistant Marey Hoeppner. She and I had many phone calls and she also was so instrumental in making sure this very pleasant Short Salle happened. My husband and I want to express our deepest gratitude in bringing the sale of our condo to a close. 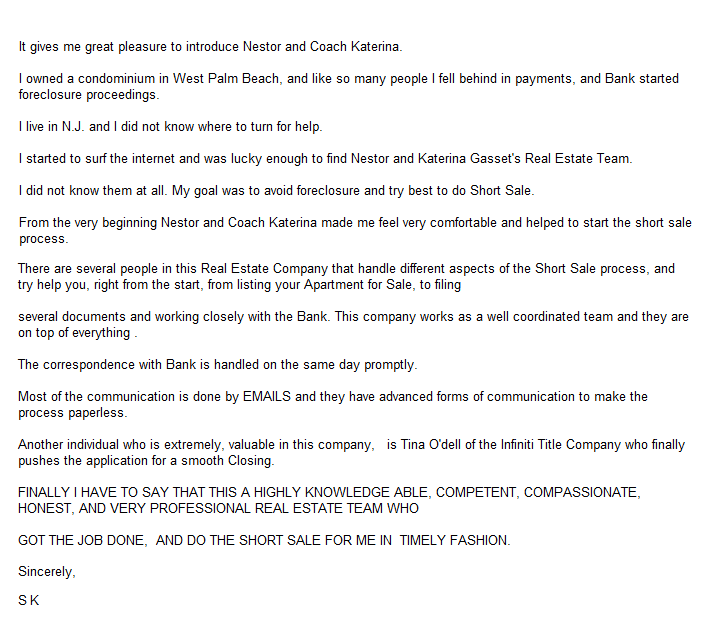 Your knowledge of short sales and your experience in dealing with the lender was key in making this happen. property in this very difficult market. 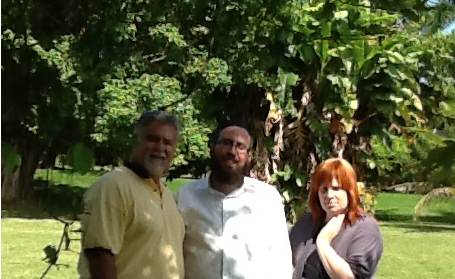 You both are also pleasant to talk to and have returned phone calls and answered all of our questions promptly. You truly are professionals to the highest degree. We will both be sleeping better at night now that the debt burden is gone. Thank you again. I wanted to take a few minutes to write this short note and express my deepest thanks and gratitude for helping us with the sale of my home recently in Wellington, FL. I was not entirely sure of how my situation with a home that was totally “upside down” was going to unfold, and I had no experience with the short sale process. There was very little information available on this subject on the internet, and the Realtors I spoke with prior to engaging you seemed to know even less than I did. You were clearly very knowledgeable about the process, and were able to describe the general flow of how things would work, and answered all my questions. You were able to put my mind at ease about the entire process, and made me feel confident that we could complete the short sale transaction. I am especially grateful for your prompt responses, and you were very easy to get in touch with whenever we needed to. I wanted to thank you for dealing with the PMI company when they nearly derailed the whole deal. You were able to expertly guide the process past this snag and get them to accept the offer. And need I mention the last minute near disaster with the buyers on the night before closing? Yet again you intervened quickly and made sure that this transaction was completed and went through closing the next day. I would not hesitate to recommend your services to anyone, as you carried yourself professionally at all times. You helped my family through a rough spot in our lives and helped us move on to a new and brighter future. I would be glad to speak to anyone in the future if they ever would like a reference. Thank You! Thank You! Thank You! On behalf of myself my wife Christy, and her parents Robert & Natalie Tutunjian, we cannot thank you enough for all of your hard work aud tireless efforts in selling our 2 condo’s in StAndrews at The Polo Club, Your Knowledge, Skill, Marketing Efforts, Professionalism, and most mportantly your pit bull like tenacity I believe are the reasons for your success with selling these properties. In a profession where many are only looking for the easy sale and the Big Commission check, you both proved that you are not just in it for the money but that you tniy care about your customers, and are not afraid of bard work to get a property sold. You both are a credit to your profession and I am sure you will continue to enjoy much success. YOU DESERVE It!! You all are unbelievable. I have never been in a situation like this where my wife and I were in over our heads and people just helped like you all! It seemed like we could litereally just sit back and things got done. Yes there was a little work on our end but not much, and any work that you needed was clearly given to us! This wasa stressful time and rebuilding will be a bit stressful as well, but without your help it would have been a million times worse!!! I mean that 100%,,You all saved us from a whole lot of stress that would have been for a long time too! I will recommend you to ANYONE giong through this, although I wouldnt wish it on anyone. As a matter of fact i needed to ask you,, my buddy is in a similar situtaion but he lives near DC. Do you only work in Florida or can you help him? I need to let him know I told him about you all, and I said I would check to see if you could help. Anyways THANK YOU FOR EVERYTHING!!!!!!!!!!! God is good and He used you all to help us out in this phase of our lives! THANK YOU! I just wanted to thank you again for all your effort and hard work. I can truly say that I have never had a real estate agent work as diligently and persistently as you both did selling this condo. I really thought it would be impossible to sell the condo in this brutal market, but you somehow came up with multiple buyers and put a deal together. I will highly recommend you to anyone I know who is in the market to buy or sell property in the Palm Beach area. FLORIDA SHORT SALE SUCCESS REQUIRE LISTING AGENTS WITH EXPERIENCE AND DEDICATION. 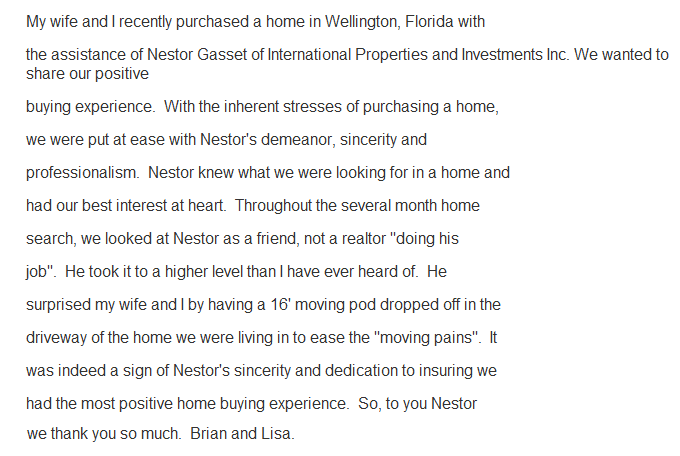 A TESTIMONIAL FOR KATERINA and NESTOR GASSET of International Properties and Investments, Inc. in Wellington, Florida. The first time I read in one of Katerina’s posts wherein she stated that she and Nestor have a 100% successful track record closing their short sale listings, all I could say was WOW! To say that I was impressed would be an understatement. I know how difficult short sales can be for sellers, buyers, listing agents and buyers agents. I also know that, when compared with the complexity and degree of difficulty involved in listing short sales, a Buyers Broker’s job is far easier. Our job, as a Buyers Broker, may be complicated with new and different procedures for each listing, each approving lender(s), each property, etc. However, it’s a piece of cake when compared with the complexity of the listing side of short sale transactions. GO WITH EXPERIENCE! I am a firm believer in the value of experience, particularly for financial advice, products or services. If a home buyer is in need of short sale real estate brokerage services, they should be seeking the services of a broker with successful short sale experience. If a real estate agent or broker is in need of referring a home owner/seller in need of short sale services, it makes sense to make the referral to an experienced broker with successful short sale experience. Last October 2008, I received a request for information about short sales. However, the property happened to be in Florida. So, I did what I always do when in need of help with any real estate matter in Florida, I contacted Bryant Tutas of Tutas Towne Realty, Inc. I refer all matters involving Florida real estate to Bryant Tutas. If it’s a buyer, Bryant will either help the buyer himself or, if the buyer is not in his area or for some reason he can’t help the buyer himself, Bryant will contact an agent who can. When I contacted Bryant about the short sale prospect, he immediately contacted Katerina Gasset who is in the geographical area of the property. Katerina took over, listed the property, worked through a myriad of problems and finally, last week closed the sale. I LOVE FEEDBACK. I got better and more frequent feedback from Bryant and Katerina about a referral about 1000 miles away than I often get from agents 10 miles away. I love feedback. Bryant kept me posted and Katerina would call when things looked like they might not work out. Ball 1. The property was listed for about $270,000. No problem getting a contract with the seller. The bank turned it down. Ball 2. Cash buyer made offer of $235,000. Bank countered to $260,000. Buyer walked. OVER THE MONTHS, THINGS BECAME A TAD TEDIOUS. Strike 1. Tenant refused lockbox, access and made it generally difficult to show. Strike 2. Owner tried to cancel listing and wouldn’t communicate with broker. The property went under contract in July and the tenant moved out in August. It appeared from the feedback that Katerina got tough with the owner who got tough with the tenant. Over the period of the past 11 months, when the property would go under contract, Katerina or Bryant would call me with an update. Of course, they also called when a contract would fall apart. The property finally closed for $235,000, the same price the bank rejected months ago. I WROTE THIS RE REFERRAL OFF ABOUT 5 MONTHS AGO. I underestimated the tenacity of Katerina and Nester. 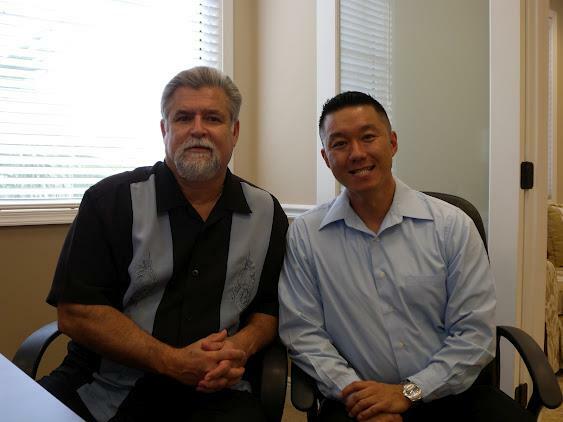 They are a powerful, experienced, hard working team who know short sale processes as well as anyone in their market. Of course Bryant Tutas is in the same league which is why this referral had a successful outcome. LAST WEEK, I got e-mail from Bryant that the property closed and the check was on the way. THE MESSAGE IS, when making buyer or seller referrals, go with experience and folks who will keep you in the loop. You just might be getting a referral check in the mail. Hard work paid off in our relocation! New Construction service and knowledge! “On behalf of my family, I would like to extend our thanks to you for a job well done in representing and assisting us with a home purchase in the Houston area. As you know, relocating from Canada was a big step for us and the home search and purchase portion involved many details new to us. Your attention to detail and extra work in presenting the market to us through to closing and follow up after is greatly appreciated. We hope you can visit us sometime in our new home. I would just like to thank you for finding us a new home. As a first time buyer I walked in with my eyes closed. You took the time to explain things to me that I never would have understood. You had patience with me and made it feel like buying a home was simple. You knew what I wanted in a home and you found the most beautiful home for me and my family. I would never have found a Realtor with the professionalism and character as you have. So from the bottom of my heart, again I thank you. I want to thank you for your services in looking for and helping establish my family in a new home during my recent company relocation. My wife and I were amazed that we found a home in only 2 days of house hunting. I believe your sensitivity to our needs made this possible. I’m not sure many Realtors go the extra mile to see that every issue for the move is covered. I know you did and my family appreciates it. We write to convey our deep gratitude for the excellent services that you provided us recently, which led to our acquisition of a beautiful property on Vantage Point Circle. Needless to say, we are very happy and proud in our new house. Thanks for always being open and professional in your dealings with us and we certainly appreciate your astute guidance, flexibility and good humor. Please do not hesitate to show this letter to prospective clients or to use us as references if necessary. When we relocated to our current home from Canada, Nestor Gasset was recommended to us from our own company representative. Nestor provided us with complete packages listing houses and met our initial criteria in various areas thus saving us time and reducing our anxiety level in trying to find a suitable home. We found Nestor to be very helpful and thorough, dealing with many issues. His services were not only limited to the purchasing of our home, he also assisted with many of our relocation problems. If we are ever in another situation requiring real estate support, Nestor will be the person working with us. We would recommend Nestor’s services to anyone relocating to this area. We would like to extend our sincere thanks for all the help you provided to us during our move from Canada. You went outside the normal boundaries of real estate services. 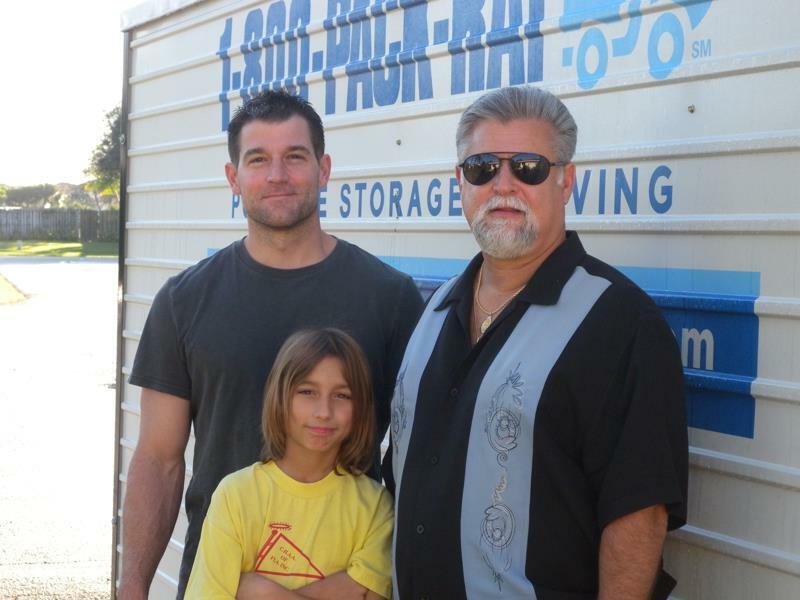 Your knowledge of real estate in this area, relocation policies and building materials was invaluable in making our move run smoothly. From our many acquaintances and friends whom you have helped move into this area this is not unusual, Nestor’s way of going the extra mile. Please feel free to use our family as a reference to your future clients. You will always be welcome in our new home. My Thoughts from my Heart… Inspired by: Katerina Gasset Many things have made a difference in my life. Many things have impacted my life, but of all the most important moments that I can remember; having the honor to meet Katerina almost three years ago at the Colony Hotel in Palm Beach was certainly a blessing in my life. I have had the pleasure to know Katerina in a personal level and in a business level. Not that many people have the passion, energy, enthusiasm and compassion that Katerina possesses. She is truly one in a billion. When I first met Katerina it did not take long at all to know that she truly speaks from the heart. Her desire to help people and make a positive impact in their lives is just amazing. I have always shared with Katerina how much I wish someday I can achieve the level of leadership and motivation that Katerina has been able to accomplish. Her background of modeling, teaching children, successfully maintained her career in real estate and amazingly home schooling her six children with her beloved husband Nestor, are just a few qualities that make Katerina truly be an example to follow. Her passion for coaching and educating people in a healthier and better lifestyle continues to impress me day by day. Katerina is just unstoppable! She is one of the most caring, persistent and dedicated as well as passionate human being I have ever known. Giving back to help others is one of her top priorities as I have witnessed Katerina numerous times making a difference towards a better life for many people that know Katerina, respect her and admire immensely just like I do. Thank you Katerina for your friendship, support and inspiration. I very much desire to continue helping each other and learning from you how to truly make a difference in people’s lives! Katerina Gasset is my Realtor of choice. She has helped me find many of my investment properties. Katerina knows how to listen to her client’s needs and goes the extra mile in making sure her clients are making the right choices. She is a smart negotiator and understands the complicated process of financing and title issues. I love having her in my corner! Have questions about short sales or the short sale process? Need specific information? Drop us a line here and we'll get back to you fast! Should You Consider A Wellington Short Sale? What Is A Real Estate Housing Hell? IMPORTANT NOTICE: It is strongly encouraged to seek competent legal and tax advice for any real estate transaction. IPI is not associated with the government, and our service is not approved by the government or your lender. Even if you accept this offer and use our service, your lender may not agree to change your loan. If you stop paying your mortgage, you could lose your home and damage your credit.